Best free DVD copy software enables you to copy DVD to DVD, backup scratched DVD, Disney DVD, etc. with no hassle. DVD backup software is facilitated in copying the content of a DVD to a new blank DVD disc, ISO Image, Video_TS folder or something for playback on media players, HDPC and mobile devices. Some DVD backup software feature additional functions such as Blu-ray support, but crashed always; some are copy protection removal, but failing in detecting Disney fake; some set as all-in-one, but helpless with scratched DVDs, etc. All demand $34 to $70. Considering above, WinX DVD Copy Pro will win your favor when choosing best free DVD backup software. It helps you easily copy encrypted DVD to new blank DVD, backup scratched DVD, Disney DVD, etc. to new DVD disc or computer hard drive as ISO, Folder, MPEG, etc. You can get this best Windows (10) DVD copy software for free on WinX DVD Copy Pro official giveaway page (no free upgrade). 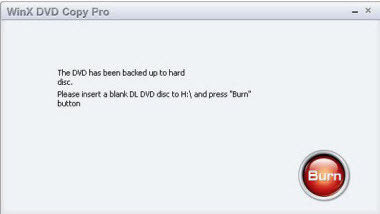 After getting it free and installing it on your Windows (10) PC, just follow this guide to backup copy-protected, Disney DVD, as well as DVDs with bad sector to a blank DVD for free. >> Best DVD backup/copy software fully compatible with Windows 10/8/7/Vista/XP OS, enables you to 1:1 copy DVD to DVD disc/ISO image/DVD folder without any quality loss in a fastest speed while reserving intact original video/audio/subtitles. Old scratched DVDs backup is also supported. 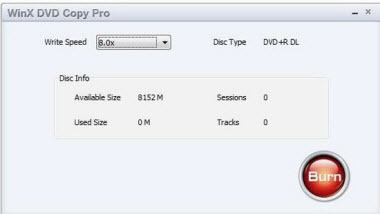 Free download WinX DVD Copy Pro on Windows 10/8/7, etc. and learn how to backup DVD to DVD or computer with this best DVD backup software for Windows (10). Step 1: There have many professional functions in this free DVD backup software. Choose this target "Clone DVD to DVD". Step 2: In the "Target DVD Burner" area, make sure the blank DVD is in the burner disc. Step 3: Click "Run" and then there will pop up a window showing the DVD backup speed. Step 4: Finally, click "Burn" to start copying DVD content to new blank DVD disc. 1) If your computer only has one DVD drive, insert a new blank DVD to DVD-ROM. 2)	If your computer has two DVD drives, it will burn DVD to new DVD disc directly. 2. Sony ARccOS bad sector: ARccOS is a copy-protection system made by Sony as an additional layer to be used in conjunction with CSS. It deliberately creates corrupted sectors on the DVD, called Sony ARccOS bad sectors, which cause DVD backup errors. 3. Disney fake: Almost all Disney encrypted DVD contains 99 titles, and the DVD movie size is larger than 40GB. So it is called Disney fake or Disney X-project DRM officially. In the DVD backup software market, little software supports such encrypted Disney DVD. But WinX DVD Copy Pro does the job nice. And it will constantly update to support any newly released Disney DVD totally free. Disclaimer: Digiarty Software does not advocate ripping/copying copy-protected DVDs for any commercial purpose and suggests referring to the DVD copyright laws in your countries before doing so. WinX DVD Copy Pro – 1:1 clone DVD to DVD, copy DVD to ISO image file, Video_TS folder, MPEG2 file on Windows (10) without any quality loss at fastest speed. It supports accessing to all region codes and copy protections, and faultlessly supports Disney's Fake, severely scratched DVDs and Sony ARccOS bad sector. DVD chapter copy and extract audio/video only are also available. Try WinX DVD Copy Pro now. 1. Free download and install WinX DVD Copy Pro below. 2. Insert source DVD to DVD-ROM. Choose "Clone DVD to DVD" or other 6 DVD copy modes. 3. Set target DVD Burner and Temp Folder. Tick remove region code, CSS, etc. 4. Hit "RUN" to start copying DVD to new blank DVD or ISO with original quality.